I remember friendship bracelets were the most popular accessory while I was in elementary school. These sentimental trinkets are special because they are all made by hand and the style and colors are always unique. It is a symbol of everlasting bonds and friendship. Some make look intricate, but friendship bracelets are all made the same way. You can make your friends feel special by making them one. If you have daughters, this would be a great activity to teach them so that they can share this craft with their friends at school as well. They’re sure to fall in love with your thoughtfulness. Pick a friend’s favorite color and surprise them with a friendship bracelet. Here is how you can make a friendship bracelet with relative ease. The more practice you get, the better the results. Read on for more information. Choose two different colors from your embroidery floss. You will need six pieces of floss. They need to measure 27 inches. Three pieces of both colors. Place the six pieces of floss together. Tie them together with a knot at the top end. Put the knot under the clip of your clipboard. Place three pieces of one color on the right and three pieces of the other color of the left. Take the three pieces of floss on the left in your hand. Loop the pieces on the left over the top and underneath the strings on the right. Push the thread through the circle and pull it firmly. This is your first single knot. Take the strings on the right into your hands. Repeat the same steps you did for the left side. Push the thread through the circle and pull it firmly. 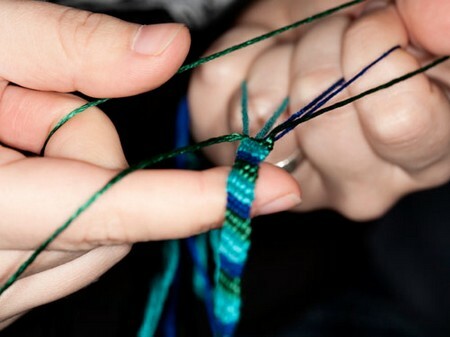 Repeat the wrapping and knotting process until you get to the correct length for this friendship bracelet. After you have reached the entire length, tie another not to make sure the bracelet doesn’t unravel. Cut the ends of the bracelet. Measure one inch from the end. Put the friendship bracelet on to ensure a proper fit..
Add special decorative features to your friendship bracelets to make them unique and special to you and your friends. Place the beads on to the center strands to secure them. You can combine the beads with colors for holidays, favorite colors, school colors and more. Be careful when adding beads for small children. They can be a choking hazards.